An illustrated guide to world religions, their origins, festivals and beliefs. This book covers the six major religions – Judaism, Christianity, Islam, Hinduism, Buddhism and Sikhism – as well as East Asian religions and modern movements such as the Unification Church. Exploring different aspects of their faiths, the text describes holy books and includes important excerpts such as The Apostles Creed from the Bible or Al-Fatihah from the Qur’an. 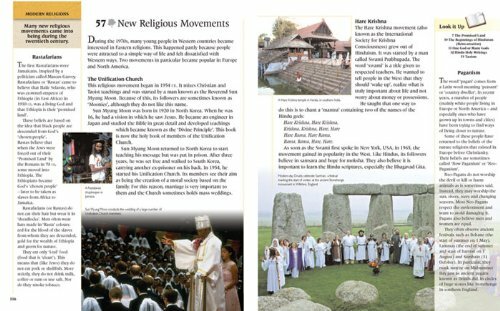 The layout is clear, generously illustrated with photographs showing places of worship, families celebrating festivals at home, children at prayer, pilgrims, priests and holy men. Maps are included where relevant, and a useful cross-reference system helps the reader make comparisons with different religions. The author touches upon the issue of religious conflict, but ends on a note of hope with the Golden Rule shared by all major religions that teaches in essence ‘Do as you would be done by’. An accessible reference book that explores complex and sometimes abstract ideas in a way that is easily understood, this should prove a worthwhile addition to a school or class library.